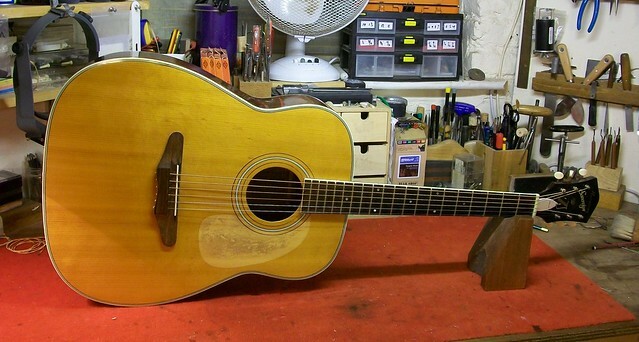 Here’s a ’60s Harmony Sovereign H1260 on the workbench. Vintage Harmony guitars have become a popular choice for collectors and often fetch high prices on auction sites. The H1260 was produced between 1958 – 1971. As previously stated these old 1260s are becoming collectors items and owners are forever looking for ways to bring out the best in them. This 1260 belongs to a regular customer and a frequent visitor to the workshop. It originally came into the workshop to have a pin through bridge fitted. Whilst it’s on the workbench I had an opportunity to give it a thorough workbench assessment and I did’t like what I saw. It had a high playing action and on closer inspection I could see that the neck had been refitted. This had been badly done and left me with the impression that this old Sovereign had been the victim of abuse in the hands of an inexperience repairer. 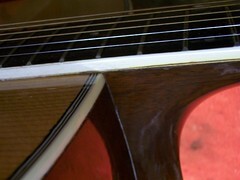 There was a strange veneer line that ran the length of the neck under the fingerboard. It appeared to (have been) be a piece of Maple veneer, but why was it there? This didn’t look like Harmony spec. 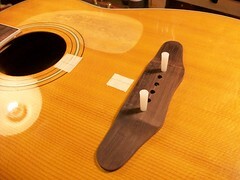 but it suggested that the fingerboard had been removed at some point in its life. After talking over the potential problems with its owner we came up with a plan to save this old jumbo. 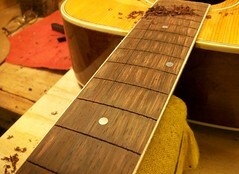 To remove the Maple veneer from the top of the neck. 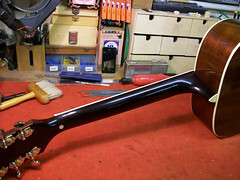 To remove the neck from the body and reset at the appropriate angle for a good playing action. 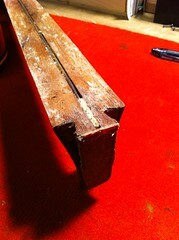 The fingerboard was (to be) assessed after it has been removed to ascertain if it could be reused or replaced. 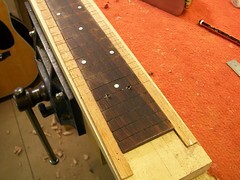 All binding around the fingerboard was to be renewed including the edge dots. 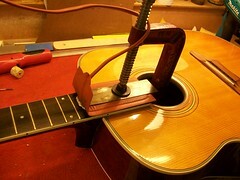 A small heat blanket was used to heat the fingerboard. For ease this was done in several stages. 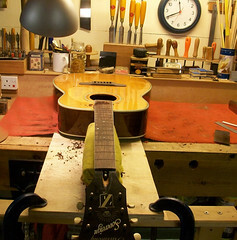 With the fingerboard removed it was a simple job to steam and remove the neck. 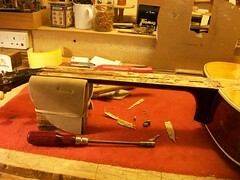 The body, neck and fingerboard were set aside for a few days to dry out and settle. 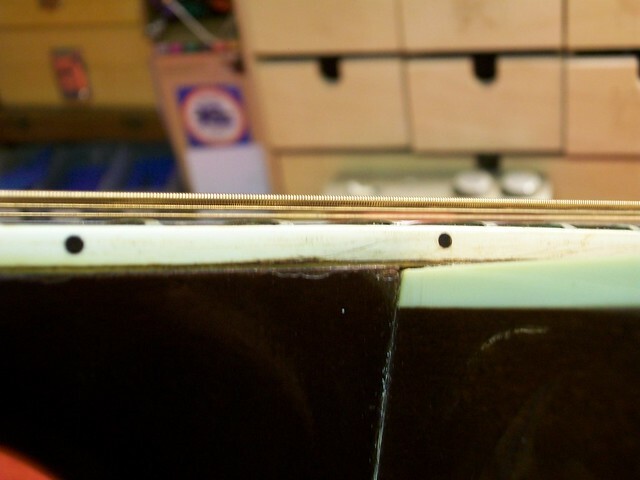 Fortunately the fingerboard was removed cleanly and without damage. 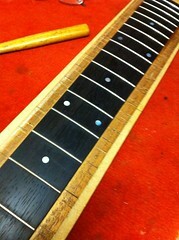 The frets were removed and the fingerboard cleaned up. 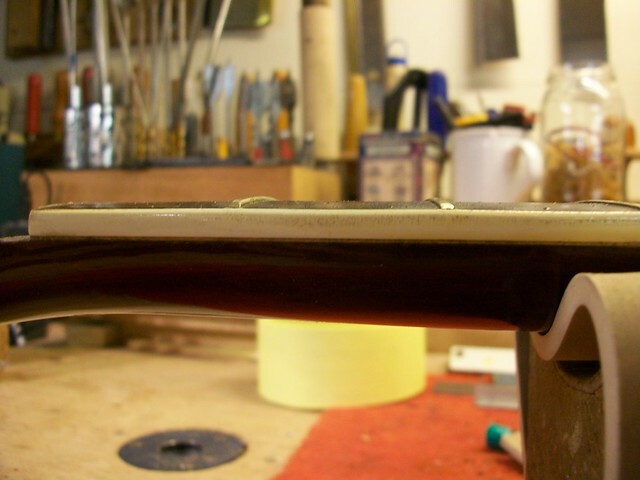 I took this opportunity to refret the fingerboard as this makes for a very easy job with the fingerboard removed from the neck. 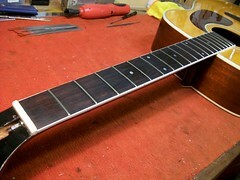 The fingerboard was fretted and new bindings attached. 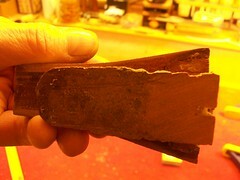 It’s clearly visible in the photo (below) that the dovetail is badly broken. This is quite common when a neck is removed. Generally speaking all the broken parts a gathered and pieced back together. However, in this instance there are no broken parts to be collected. This means that these parts were omitted on the last neck reset! The dovetail end was cleaned up as best as is practical and the neck reset. 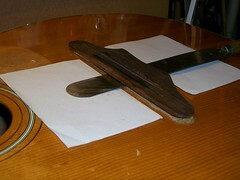 The edge bindings were trimmed to size and the fingerboard reattached to the neck. Why bother changing the bridge? As previously mentioned owners are forever trying new ways to bring out the best tone in their Harmony guitars. A pin through bridge is an efficient way of enhancing the bass and mid range tones. 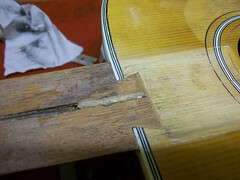 This is partly due to the increased break angle of the strings from the saddle to the pin hole and partly due to the 90° angle of the string through the bridge and soundboard. Another beneficial factor is the direct contact of the string’s ball end with the internal bridge plate beneath the soundboard. A purpose designed and made metal block was heated to approximately 400°F. The heat transference was enough to soften the glue holding the bridge. The new bridge design was based approximately on the same shape and dimensions as the old bridge. 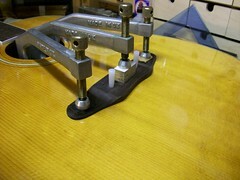 The new bridge has an extended front to allow for correct saddle position and therefore accurate intonation. The footprint of the old bridge was cleaned up and a soundboard patch installed. This ensures that the new bridge will stay stuck. 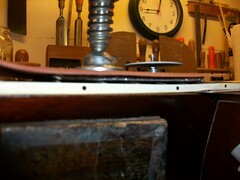 The new pin through bridge was fitted and glued into place. The guitar was strung up and tested. Some strings were choking around the 12th fret area. This was a bad sign and suggested that there was a slight hump in the fingerboard around this area. The only course of action was to defret the guitar and reshoot the fingerboard. This is unfortunate as this had already been refretted at the start of the restoration. However, my optimistic thinking was that it could work out fine and there was very little lost in doing the earlier refret when the fingerboard was loose. 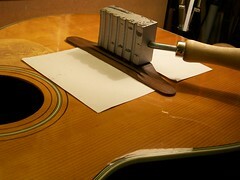 The frets were removed and the guitar was prepared for the reshoot. 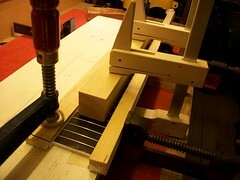 This entailed using a jack plane and cabinet scrapers to smooth out the hump in the fingerboard. Some of the inlays were lost. 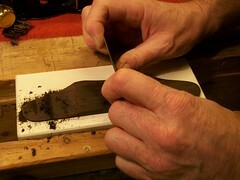 With the slight hump removed new M.O.P dots were inlayed the fingerboard was refretted. A new nut was made and fitted along with a new scratchplate. 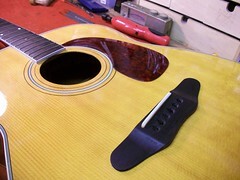 The back of the neck was refinished to disguise a multitude of chips and breakouts around the binding area. This short video clip shows the transition of this instrument through restoration. If you enjoyed reading this blog please give some feedback by clicking the like button below. 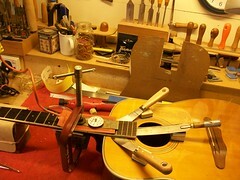 Great site definitely inspirational, I will start to revive some old guitars! Good luck with any restoration. Beautiful work, and such a fine workshop. It’s wonderful to see so much effort going into a 1260. They are entirely deserving of it. I’ll guess the maple veneer was a misguided effort to lower the action…good thing it was reversible glue! I have a special appreciation for the design of the bridge you fashioned: it perfectly echos the Harmony original. is missing and the plastic parts on the top and bottom of the neck are cracked and aged. Is there a source for Souveriegn parts? If so, would you mind sharing that information? Love your detail and demonstrations. I have learned alot, and you have given my some idea’s on some restoration’s that before I knew nothing about. Good luck with any future projects. I have an H1260 – bought new in 1968 – my pride and joy, loved and looked after, a great guitar. Only problem I have had is the scratch plate dropping off; a local repairer advised me to use double sided adhesive pads to stick it back on as he was unsure which adhesive he could safely use. Done that, but it vibrates occasionally – perhaps not enough pads !? 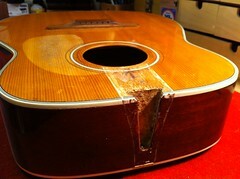 Just had a look at some of your other vintage repairs – marvellous work. Proper craftmanship ! Great site. I happen to own a H1260 and the action is HORRIBLE. 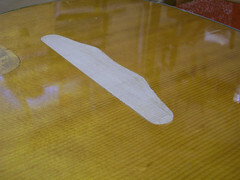 Also the finish is cracked and the neck appears to be warped (explaining the action). What would it cost to restore my 1260? Please email me @ jhooper0015@kctcs.edu. Thanks a bunch and absolutely beautiful restoration!! Great article. I picked up a similar Souverign at a flea market near Boston in the early 80’s. 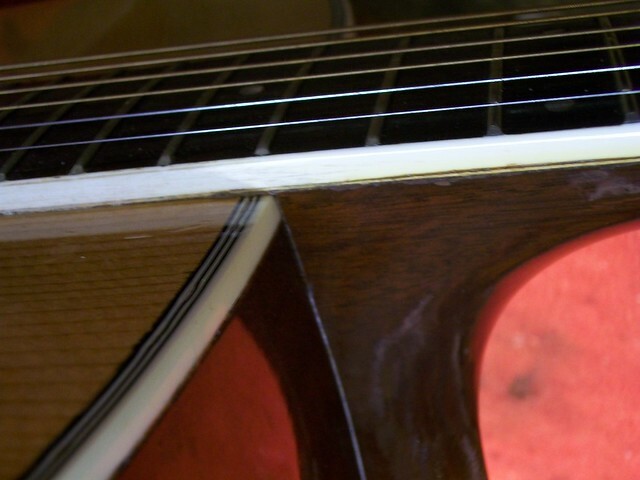 The only differences were a plain bridge, and It came with a removable pickup that clipped in on the sound hole, with the wire running through a special peg in the bottom of the guitar. I always thought it had a nice sound, never realizing that it was a quality instrument till I started researching it tonight. I have enjoyed playing it over the years, and my daughter picked it up and taught herself how to play. It took a tumble in the driveway a few years ago wiping out a considerable chunk of side panel. Since I do not have the expertise to repair it, I thought about placing a fiberglass patch along the side to halt any splitting, however after seeing your article it makes me think a more serious repair might be in order. Where can I buy tuner bushings? My 1969 H. Svereign uses small ones that I have been unable to locate. My sovereign acoustic is all great except for the little gap in the neck heel/joint area… What should i do? One question- where did you find the replacement pickguard? Been looking everywhere. A model number or website would be great! 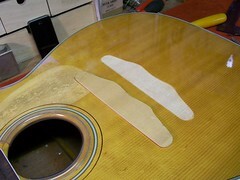 Still hoping to find out about the pickguard after three patient years : ) Did you make it or buy it elsewhere? I need one! Sorry can’t help as the owner supplied the scratchplate and I no longer have his contact details. Ok thank you for the info. Wonderful work on this guitar, I only wish you could restore mine too! Thanks. 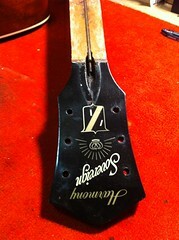 NEED NEW PLASTIC HEAD STOCK THE PLASTIC WITH THE SOVEREIGN LOGOS WHERE CAN I FIND ?